Feeling a bit lazy? Don’t feel like buying cards, or spending lots of money on gifts for your e-friends or a real life friend? $1.99 should be the only price you need to pay to make anyone happy during the holidays. Christmas [email protected] iPhone Application offers a wide range of beautiful templates along with adding your own customization to it. 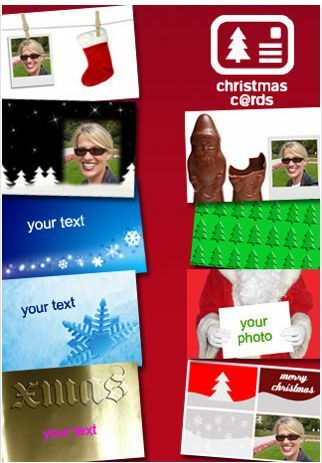 Feel like sending huge amounts of e-cards to all of your e-friends with your picture on it? The templates are totally customizable, allowing you to change photos, backgrounds, and colors. You are able to add any picture you want along with customization to blend into its surroundings. You can make it a polaroid, or just simply add a drop shadow. Once your finished with your amazing creation, save it to your album, and watch this: without even leaving the application, you can send it to all your friends. Don’t feel like emailing them? Save them as a photo and send them off over FaceBook or spread them over Twitter. Everyone will love your neat, and customized cards! However, every iPhone application has its downsides. Although it may be a steal of a price, you get a bit of what it is worth. It comes with 50 pre-set templates you are able to edit and mess around with; however with a complicated, and hard to use interface it may slow down your process of making cards for every single person on your list. Things as simple as changing the font size is not exactly possible. Cards aren’t exactly very nice looking if you have text all over the pictures. When you’re ready to say hello, or a Merry Christmas to all your co-workers or friends in a neat way, Christmas [email protected] app for iphone and ipod touch is a great way to do it inexpensively. At a price of $1.99, anyone can celebrate the holidays without draining their pocket. You could Buy this great iPhone App for Christmas here. iPod Touch Accessories: Entirely Elating!